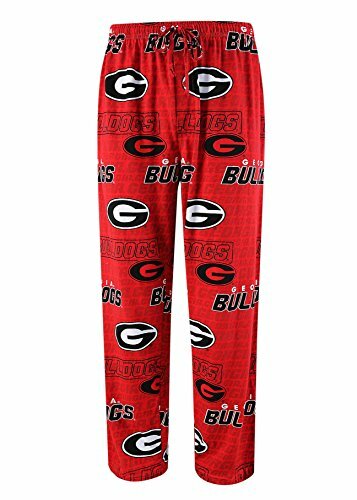 Curl up on your couch wearing these men's NCAA graphic pajama pants and watch UGA's Bulldogs bring home another win. Made from ultra-soft 100% cotton for a breathable fit, these pants come with an adjustable drawstring waist, side pockets, and a straight cut. The allover graphics let you show off your team spirit from the comfort of your home. Curl up on your couch wearing these men's NCAA graphic pajama pants and watch UGA's Bulldogs bring home another win. Full elastic waist with adjustable drawstring. Button fly. Side seam pockets. Straight leg. Screen-print design and allover graphics let you show off your team spirit from the comfort of your home. Made from ultra-soft 100% cotton for a breathable fit. Machine wash. If you have any questions about this product by Sideline Apparel, contact us by completing and submitting the form below. If you are looking for a specif part number, please include it with your message.